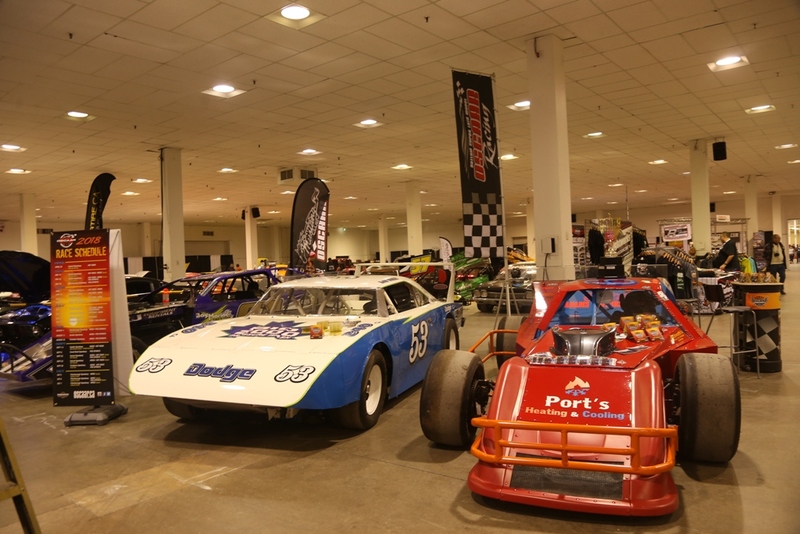 It was a busy three days, but it was worth it for everybody involved as the 2018 Motorama Custom Car and Motorsports Show was a success for OSCAAR. Throughout the weekend, various fans stopped by the booth and picked up a schedule, speaking of their hopefulness to attend an event, whether it be Kawartha Speedway, the season opener at Sunset Speedway, or the series’ lone trip to the dirt at Brighton Speedway. Fans also showed off their appreciation of the hard work put in by the 2017 OSCAAR Modified Champions Luke Gignac and ADAMS Motorsports on their No. 99 Modified. Their attention was also caught by surprise in the reveal of Brad Martin’s Dodge Daytona for the OSCAAR Hot Rod Series. Combined with seeing Jeremy McLean’s Chevelle and Lance Foster’s No. X, appreciation roared in for the creativity that the series’ open rulebook has allowed in the beginning stages. Fans spoke of their excitement based on what they saw last year, as well as watching that build with the in-progress build photos that have been showcased thus far. The OSCAAR Pro Sprints were not left out, either, as both James Stanley and Steve Belfry caught the fan’s attention with their striking paint schemes. There was also admiration felt there, as fans appreciated the craftsmanship and uniqueness that the cars bring. For those fans who ventured further throughout the show, they got a glimpse of 2017 OSCAAR Hot Rod Champion Tyler Hawn’s Belmont which was featured in Yesterday’s Speedways booth. OSCAAR was also featured on the Johnsonville Stage throughout the weekend, as well. Series President Dave Gainforth spoke on Friday night’s Short Track Promoters Panel about the excitement for the series and select events heading into 2018. His enthusiasm was matched by some of the other track promoters who shared the same feeling in welcoming OSCAAR this upcoming season. Four of the five OSCAAR Champions took part in the Short Track Night of Champions – 2017 OSCAAR Outlaw Super Late Model Champion Glenn Watson, Gignac, Hawn, and 2017 OSCAAR Midget Champion Brent Kemps. Each driver was recognized for their respective accomplishments, handed a plaque, and spoke to the crowd on hand. Heading into every season, there is always a lot of questions to be asked, and answered. We still have lots in that variety, but there’s one thing for certain – it’s going to be a great time, and we hope to see you out at the track this year.